As our liturgical year closes tonight, we end with a somber tone in today’s Gospel. Jesus’ words feel so heavy and hard and gloomy. My melancholic heart loves it because I see how He is pointing through darkness into light. Jesus is my gentle but firm teacher, and He’s asking me to hope in Heaven. Since I am so melancholic through and through, I can easily get stuck in the dark. It takes great effort on my part to reach out and see the promise that Jesus is pointing to. But when I allow myself the time and space to sit quietly in His presence, I can feel that little tug on my heart that longs for Heaven and union with my Creator. 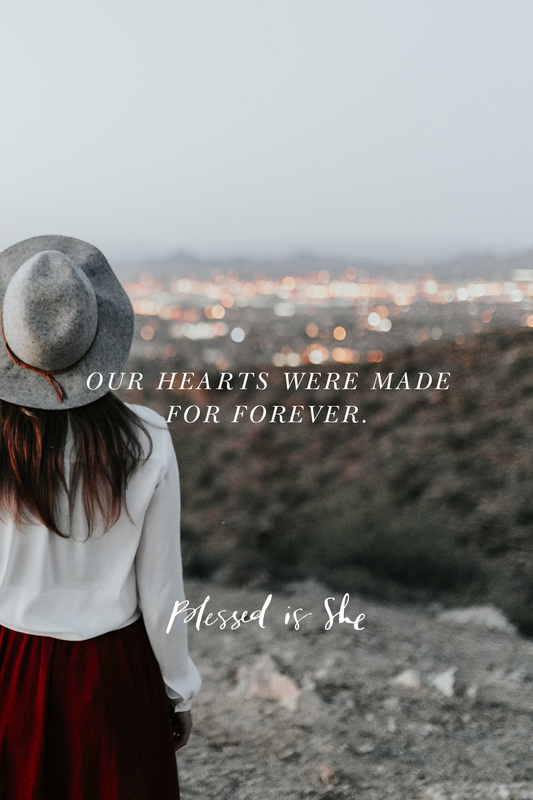 The reality is that our hearts were made for forever, and as we enter a season that can become contorted and focused on the material, I hope that you and I can focus on the things that point to that forever. Our Christian faith gives us a unique perspective to see that the good things in life carry a common current: this world isn’t the end, and the good things point to something greater. Good friendships, good food, good music. . . they all carry a shadow of the ultimate goodness of God. When I orient my heart towards Heaven, all those good things in life become even sweeter because they are tastes of it. As we enter this season of Advent, sisters, let’s delight in the good things of life not simply because they are enjoyable, but because they are signs of God’s deep love and desire for us. When we pray the Liturgy of the Eucharist at Mass, we pray in union with Our Lord, Jesus Christ. Read more about the Eucharist Prayer and the Communion Rite here. Beautiful, true, and so easy to forget during such a busy season! Thank you for the reminder, and I appreciate the link for further reflection too! Thank you for your reflection! I am looking forward to this Advent season, for a deeper relationship with the Trinity, and living with a more fervent desire for salvation. It’s bittersweet, as we come to the close of this liturgical year and today’s gospel reminds us to choose life, not judgement and condemnation. Now, with the joys of the Nativity approaching, we get to start all over, in a new year! What great love, for God to bring us Jesus! God bless you this Advent season and through Christmas!